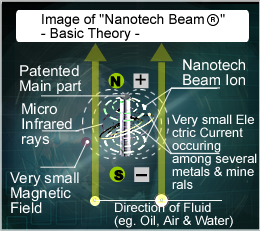 Nanotech-Beam is the ANSWER of Nano Tech-Beam Theory on fruid activation! The bacis principles concerning Nano Tech-Beam were brought forth with the help of Kanazawa University. The difference of electrical potentials among different kinds of metals and minerals generates a minimal electric (pico-level) current together with a very small magnetic field and infrared lays. The small magnetic field and infrared lays work mutually. This NanoTech-Beam, the small magnetic field and infrared lays work mutually. As a result, molecules of fruid become minute. 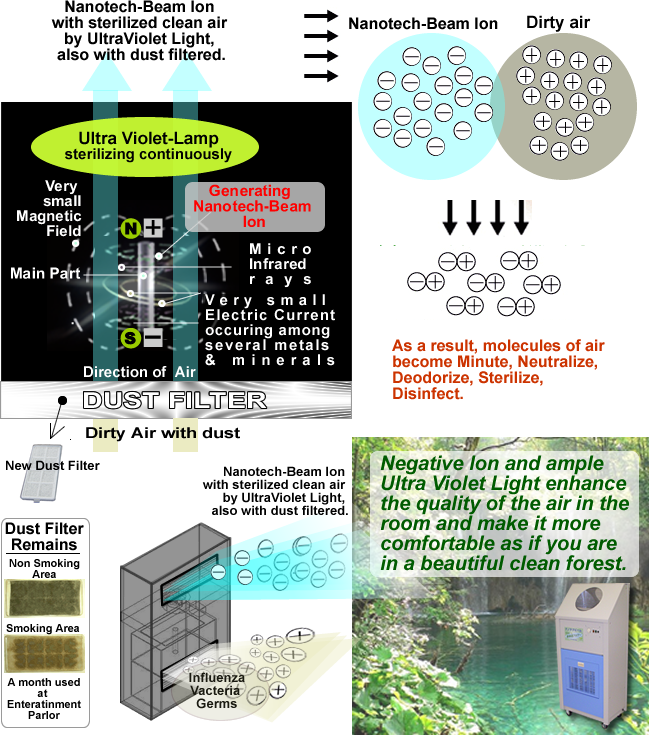 Negative Ion and ample Ultra Violet Light enhance the quality of the air in the room and make it more comfortable as if you are in a beautiful clean forest. The below is a image of this technology.